» Home » 2019 » January » 18 » Alpine Ski Starts The Season On A High Note! 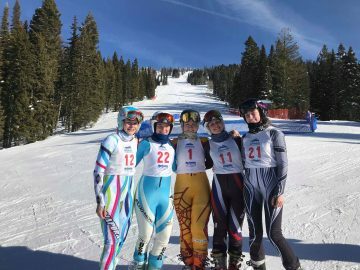 Alpine Ski Starts The Season On A High Note! After a great training camp in Whistler, that resulted in slightly more powder skiing than gates, the Alpine Ski team was ready to take on the first race of the season. Last weekend the skibirds made the long trek down to Mccall, Idaho fully geared to storm down the mountain at full speed. After the two days of racing the team produced some stellar results and are starting the season on top. The women’s team skied their hearts out to take the win on the first day and did not disappoint on the second day by making it a double W’s. A big congratulations to senior Michele Warner who led the team to victory by winning the races both days, followed closely by Helena Newboult and Anastasia Kiku. The men’s team had a rougher go, not having a full team for either day, however the guys persevered and produced some great individual results. 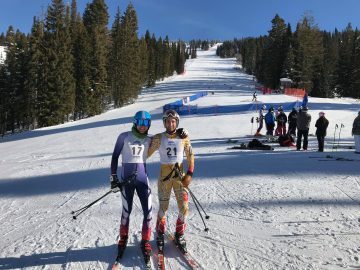 Second year John Forssander skied his way to a 8th finish on the first day, and freshman Max Duso led the charge the second day with a top 15 finish in his first ever ski race! Check out below for full UBC results. To see all race results check the USCSA website here and make sure to follow along on live timing this weekend watch the skibirds in their first slalom race of the season, at 49 degrees north! Follow along on the website and in our newsletter for more features and team updates!